Do you have a clear idea of the eyewear you’re looking for? Or perhaps you just haven’t found the right model yet? Team up with us to design your own new eyeglass frames! 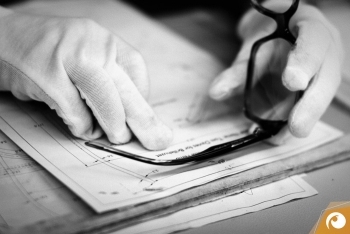 In collaboration with Tom Davies, we produce eyewear that is tailored to your exact specifications. This unique handcrafted eyewear is made to exactly fit the anatomy of your face. A high measure of individuality and a perfect fit is thus guaranteed. Fitting you with eyewear that looks and feels great! At the beginning of each new pair of glasses there is an idea. We will develop this idea jointly with you. Perhaps a few small changes to a frame from one of our sample collections is all that will be needed to make it perfect for you. But perhaps you have envisioned an entirely own design that you would like to realize with our help? We go about it by first selecting from an array of materials and also making a decision on the intended form and color. Any kind of embellishment to your glasses, a special hinge assembly or the like, can also be realized. We will also carry out a series of measurements to exactly capture the anatomy of your head. Once these parameters are in place, our design team will be in the position to perfectly fit your eyewear to your features. Based on this data and your specifications, the designers from Tom Davies’ team can prepare a design blueprint for you. 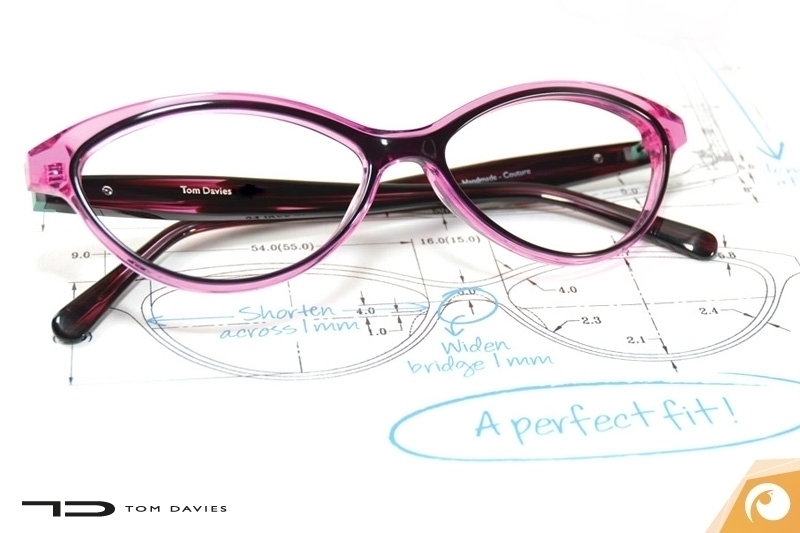 The design blueprint is then used to virtually fit you with the new eyeglass frame. This is done by adding the true-to-scale design to a picture of your face. This gives you the opportunity to appraise the glasses in advance. Upon request, we’d be happy to make some modifications to the design of your new glasses at this point. Your unique eyewear is subsequently handcrafted exclusively for you. As an expression of your individuality, your name will be engraved into your custom eyewear. There is not just one way to be fitted with glasses. Manufactures such as Tinpal, Feb31st and Lindberg give us the possibility of customizing the nose bridge and sidepieces for you with regard to size, form and length. Your requests with regard to color can also be honored. Moreover, we can design the desired shape of lenses for a rimless pair of glasses and thus offer countless variations for your new pair of customized glasses. You can discover them with us!